What was viewed as inconceivable a year ago is now a reality - roughly $ 30 -trillion of wealth was erased from global stock markets, during a brutal 15-month bear market that began in October 2007 . S peculators scrambled for the exits as a crisis originally thought to be limited to the US-mortgage sector morphed into a full-blown “credit crunch,” unlike anything experienced since the Great Depression of the 1930's. The bursting of the US house price bubble has so far, resulted in $1.1-trillion of losses for banks and brokers worldwide. Another half-trillion of losses are expected in the year ahead. The source of these huge losses was reckless speculation in the form of sub-prime lending and securitization of toxic mortgages by Wall Street dealers, - whose reckless pursuit of bloated profits, precipitated a breakdown of the global financial system, that is now threatening to plunge the world into a new Depression. However, when it comes to Wall Street's financial elite, there are no limits on the amount of money handed-out with no-strings attached . The US government has pledged $8-trilion trillion to Wall Street banks and finance houses with loans, cash infusions, and federal guarantees of assets, while haggling for months over a paltry $17-billion for the big-3 Detroit automakers to rescue them from bankruptcy. In a deal reached shortly before midnight, Nov 24 th , US Treasury chief Henry Paulson devised a scheme to enable Citigroup to offload a $306-billion pool of worthless residential and commercial loans, and mortgage-backed assets, onto the balance sheet of the US-government. It marked the single biggest bailout to date, outstripping the $200 billion for the takeover of Fannie Mae and Freddie Mac, and the $150-billion handed to insurance conglomerate American International Group. Timothy Geithner, tapped as the next US Treasury chief, was a principal player in the Citigroup rescue, which allowed executives Vikram Pandit and Robert Rubin to keep their jobs, even after they led the bank to ruin, as a result of aggressive involvement in the highly lucrative sub-prime mortgage market. Moreover, Citigroup received $27 billion capital infusion, in return for preferred stock, in addition to the $25 billion handed to Citi by the Treasury the previous month. However, the agreement made no requirement that Citigroup use the federal money to lend to businesses or consumers. And herein is the “crux of the problem,” leading the US-economy towards depression. Instead of lending the funds that the Federal Reserve has aggressively pumped into the banks, through the purchases of various securities, Wall Street's banking cartel is hoarding the cash, to cover write-off's, or simply parking the excess funds into Treasury-bills. Less than one week into the New Year, the latest data suggests the US-economy has a hangover from the Crash-of-2008. “Households and businesses face an ongoing credit crunch, housing and financial wealth has plunged,” said San Francisco chief Janet Yellen on Jan 4 th . “This is the central problem of the crisis. The impact on consumer spending from the decline in wealth is quite substantial. And house prices continue to slide. Many forecasters expect this to be one of the longest and deepest recessions since the “Great Depression,” Yellen warned. The power of Fed rate cuts to as low as zero-percent to revive the economy is failing. Instead, t here is a need for aggressive government intervention to boost the flow of credit to businesses and households. But what will emerge after the financial crisis are three banking giants, Bank of America, JP Morgan Chase, and Wells Fargo, who have gobbled-up their failed competitors, and now control fully one-third of all US-bank deposits. The big-3's ability to set lending rates and access to credit gives them greater control over the US-economy, and by extension, the global economy. Commodity markets plunged in the second half of 2008, suffering the biggest rout in five-decades, tumbling in tandem with global stock market meltdowns for the first time since 2001. 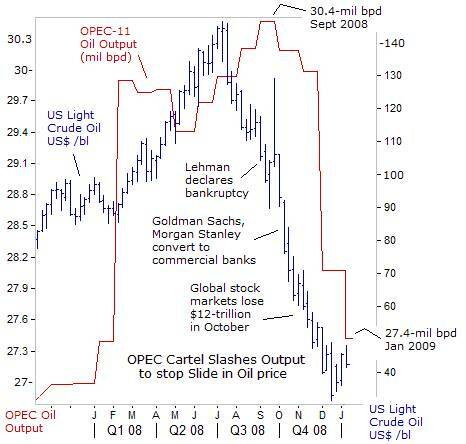 A fter the US Treasury allowed Lehman Brothers to default on its debts, the banking cartel responded by tightening credit further, forcing highly leveraged hedge-fund traders into panicked liquidations of base metals, crude oil, and grains, at bargain-basement prices. Goldman Sachs and Morgan Stanley sought shelter from the financial meltdown, by converting into commercial banks, and paring-down risky positions in commodities, in order to meet more stringent regulations. Until the US-government finally cracks-down on the powerful banking cartels, and brings an end to the “credit crunch,” the global economies would remain in recession, keeping commodities weak. Reflecting the scope of the “credit crunch” last year, US-banks slashed loans to i nvestment-grade companies by 52% to $319 billion, and bridge or temporary loans were the only funding source for cash-starved companies. Loans backing leveraged buyouts plunged 80% to $41.3 billion. With American bankers cutting-off credit to the private sector, US retail sales fell for five straight months, the longest string of declines in 16-years, US-auto sales plunged 35% in December, and US employers slashed nearly 1.2-million jobs in the final two months of 2008, to preserve cash. Tight-fisted bankers choked the global shipping industry to death, by suspending “letters of credit” that importers and exporters rely upon to finance overseas trade. Of the $13.6 trillion of goods and materials that are shipped across the high-seas each year, roughly 90% of the cargo is financed with “letters of credit,” issued by bankers, guaranteeing payment to the shipper, once shipments are delivered to the buyer. With banks cutting-off “letters of credit,” the wheels of global shipping has ground to a halt, and idling some 200-vessels worldwide. The Baltic Cape-Size Index, which measures the cost of shipping coal, iron ore, and steel, plunged 95% in just five-months. At the market's peak in June, daily charter rates for 170,000-ton Cape-Size bulk carriers cost $234,000. In November, it was available for $3,000 /ton, - and below break-even. Clarkson's of London , the world's largest shipbroker, indicated that new-orders for ships had plunged from 378-vessels in October 2007, to just 37-ships in October 2008. 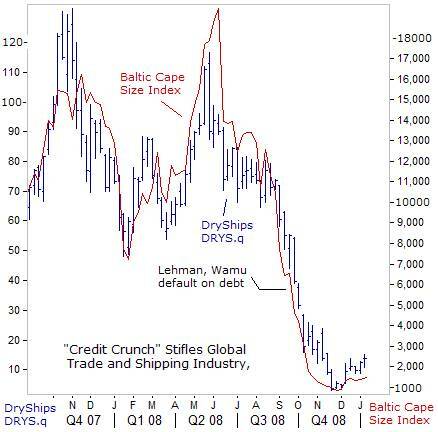 Many bulk-shippers bought vessels last year at high prices, financed with bank loans, and are now filing for bankruptcy. But Cape-Size ships that sold for $150 million in the summer of 2008, now sell for $50 million, leaving many shippers under water. Danish dry-bulk operator Atlas Shipping, with a fleet of 41-ships, filed for bankruptcy, - current freight rates result in a loss of $3 million a week . The bursting of the housing bubble in the United States, and troubles in the shipping industry, have in turn, devastated Asian nations, that increasingly rely upon foreign exports to fuel their economies. Roughly 45% of emerging Asian economies are linked to exports, - and 10% higher than during the Asian financial crisis. T he World Bank expects global exports to tumble -2.5% in the year ahead, a precipitous drop from the 10% growth rates of two-years ago. Japan 's exports plunged 27% in November, as global demand for its autos fell 32%, and semiconductors sales slumped 29-percent. Shipments to the US plunged an unprecedented 34%, and exports to China and Hong Kong , Japan 's largest trading partners, tumbled 25%, the steepest decline since 1995. Japan 's economy has contracted in the past two quarters, and is mired in recession for the first time since 2001. Toyota , Honda Motor, and Sony are shedding thousands of workers and closing production lines as profits dwindle. The dollar fell 25% against the Japanese yen last year, due to unwinding of carry trades. W hen the dollar loses 1-yen, it cuts Honda's annual operating profit by 18-billion yen. Exports from South Korea , Asia 's fourth-largest economy, fell 17.4% to $27.29 billion in December from a year earlier, due to a slump in sales of electronics, cars and ships. Exports account for 52% of Korea 's GDP, and its economy could shrink 3% in 2009, - the first recession since the Asian financial crisis . India 's industrial production contracted for the first time in 15-years in October, and its exports plunged 10% to $11.5 billion in November from a year earlier after contracting 12.1% in October, the first decline in seven years. The gloomy news has cast doubt on government's ability to stimulate growth, with only $4 billion in new spending projects and a broad 4% tax cut. 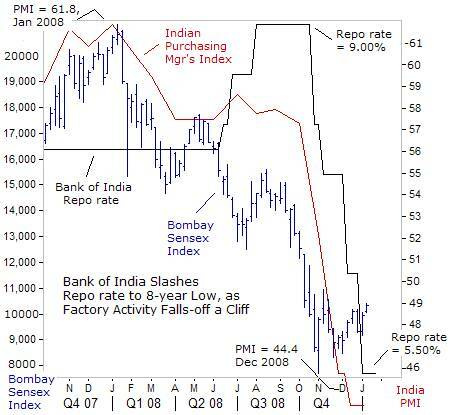 India 's central bank slashed its repo rate by 1% to 5.50% last week, and its fourth giant rate-cut in four months. Indian manufacturing sector continued to contract in December to its lowest in more than 3-½-years, signaled by a further slide in its purchasing managers' index (PMI) to a reading of 44.4, falling for a fourth straight month and below November's 45.8. Earnings for the top-30 Bombay Sensex index companies are expected 0.2% lower in the fourth quarter from a year earlier, compared with a growth of 5.5% in the September quarter, the first dip in earnings for the index since 1999. The Bank of India has moved aggressively to increase credit availability, and rebounding stock markets across Asia , prompted a shift into riskier assets . 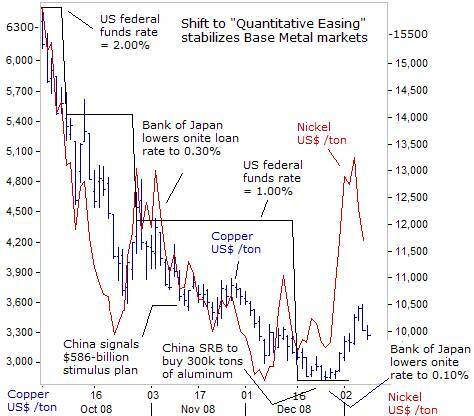 Can China put a Floor under Base Metals? Metals such as copper and nickel are sensitive to the direction of the global economy, and prices tend to track global industrial demand. As much as 70% of the world's nickel output goes into making stainless or other steel alloys. China accounted for two-thirds of global growth in steel production over the past 10-years, to become four times the size of the US steel industry, peaking at 500-tons per year. China now accounts for more than 60% of the global demand for nickel . 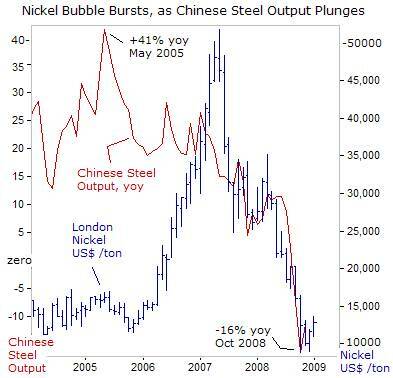 So when Chinese steel production plummeted to 35.2-million tons in November, or 12% lower than a year earlier, the price of nickel tumbled to below $10,000 /ton. ArcelorMittal, the world's biggest steel-mill, slashed its output by 35-percent. Other rivals - Corus Steel ( India ), Nippon Steel ( Japan ), Severstal ( Russia ), BaoSteel ( China ) and Voest-Alpine ( Austria ), have taken similar measures. American steel production plunged 50% since September to 1-million tons a week from 2.1 million tons in August. Likewise, the global composite steel price fell 40% to $676 a ton. Elsewhere in the industrial sector, copper was particularly hard hit, tumbling from a record $8,940 /ton in July, to a four-year low of $2,650, as Wall Street bankers tightened credit and pushed the world economy into recession. Copper prices have tumbled amid indications that China 's vast manufacturing sector, which functions as the cheap labor workshop of the globe, suddenly went into free-fall, when European, Japanese, and North American demand for its exports collapsed. The Chinese Purchasing Manager's Index (PMI), which measures the activity of major Chinese companies, plunged to a record low of 40.9 in November. But there were glimmers of optimism hidden in the December report, with the new orders index for Chinese exports picking-up to 37.3 from 32.3 the previous month, and the sub-index for output climbing to 39.4 in December from 35.5 in November. Stockpiles of copper monitored by the London Metals Exchange have grown to 342,000-tons, the highest since February 2004, - equal to 7.5-days of global demand, up from 3.2-days in July. 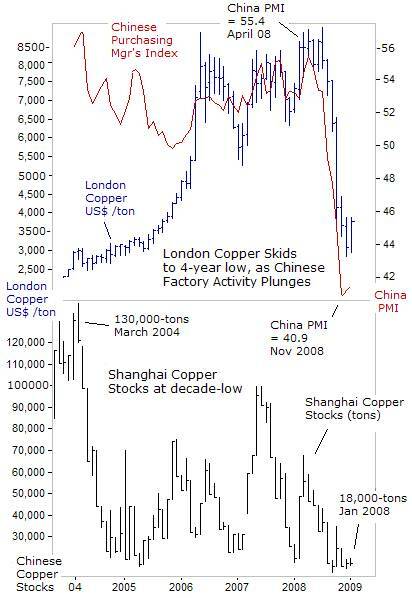 However, copper stockpiles in Shanghai have been whittled down to only 18,000-tons, the smallest supply this decade. London traders reckon Chinese users of the red-metal will eventually be forced to replenish their dwindling local supplies, perhaps after the Chinese New Year on January 31 st , which in turn, can help put a floor under the copper market. China accounted for 20% to 35% of the world's consumption of base metals last year. Base metals got a psychological boost on Dec 25 th , when China 's State Reserves Bureau (SRB) agreed to buy 300,000-tons of aluminum at 12,300-yuan ($1,800) per ton in January to support its local miners. The purchase price was at a premium of 10% over the key Shanghai aluminum futures contract. The SRB might also buy 400,000 tons of copper, as part of a massive stimulus package totaling 4-trillion yuan or $586-billion, amounting to 15% of China 's gross domestic product (GDP) to build railways, subways and airports . That amount of copper would cost China $1.5-billion at today's prices. At the same time, Freeport-McMoRan is planning to reduce its copper production by 200-million pounds this year, and 500-million pounds in 2010, to shore-up prices. Beijing might buy the entire 1-million tons of aluminum that is sitting at warehouses and smelter yards in China , removing the excess supply off the market in one-swoop. At the same time, Alcoa, the world's largest aluminum maker, has announced plans to cut more than 15,000-jobs world-wide, halve its capital spending, and will scale back aluminum output by 2-million tons this year. Many traders in London and New York were caught by surprise, when the price of nickel suddenly jumped 40% higher towards $13,550 /ton last week, its biggest rally in 10-months. The surprise rally was tied to reports that US-steelmakers and their unions are pressing President-elect Barack Obama for on infrastructure projects to revive the sagging market. The Euro-zone also has a 200 billion-euro ($278 billion) stimulus plan, and Japan will spend 10-trillion yen ($111 billion) on its economy . Almost all of the world's major central banks are engaged in a race to the bottom on interest rates. The Bank of Japan lowered its benchmark loan rate to 0.1% and re-instated “quantitative easing,” (QE) – the printing of yen through the purchase of Japanese government bonds and commercial paper, and on Dec 7 th , signaled its intention to drive long-term bond yields lower. 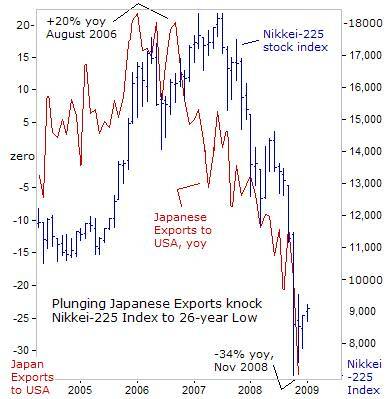 Base metal traders are gauging what impact these measures have on sentiment in the Nikkei-225 index. Earlier this week, copper and zinc futures soared their daily limits, on reports the SRB is planning to add zinc and copper to its inventories. The timing could hardly be better. Shanghai copper and zinc futures have fallen by two-thirds from their peaks. China has not built up the key base metals in its state reserves, and Beijing wants to avoid a return to massive price rises of the past few years. So investing in cheap base-metals now could help dampen prices, once demand picks up steam again. China 's stimulus program might be aimed at the reconstruction of Sichuan province, which as devastated by an earthquake in May. Beijing has already begun buying up grains and soybeans to support farmers, but it has yet to fully reveal its designs to build the state's metals reserves. Yunnan province, a major base metals production region in southwestern China , said it plans to buy one-million tons of base-metals, ores and semi-finished products to support local industry. If it goes ahead with purchases, China could end up importing more refined copper and nickel and cutting into domestic stocks of aluminum, lead, zinc and tin. Wen Xianjun, deputy of China 's Nonferrous Metals Industry Association, said Chinese banks should buy aluminum as an investment due to the low price, because production costs would be higher than current metal prices within three to five years. 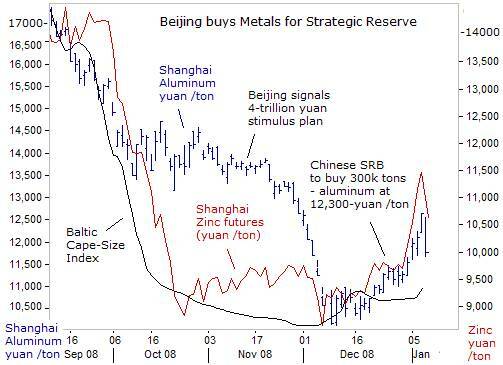 “If I was a banker and had money, I would buy aluminum now,” Mr Wen said. 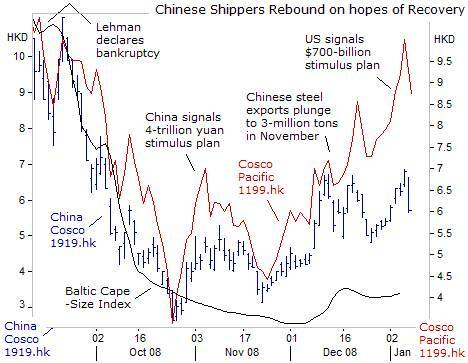 Beijing 's vow to spend 4-trillion yuan ($586 billion) to revitalize its economy has stabilized the world's battered bulk shippers. In the past few weeks, the mood has improved a bit. The Baltic Cape-size sea freight index has stabilized over the past two-months, but is not yet above break-even for many shippers. Still, shares of China Cosco, 1919.hk, the world's largest operator of iron-ore and coal ships, and Cosco Pacific 1199.HK, operating 160-ports around the world, doubled from the November low, amid expectations of a rebound for the Baltic Dry Index. The Australian dollar reached a 20-year high of 98.50 US-cents last year, and hit an all-time high of 107.50-yen, before sliding sharply in tandem with commodities, which account for 60% the nation's exports. Prices for coal, iron-ore, and crude oil, Australia 's biggest export earners plunged in the spot and futures markets, as the seizure in global credit markets tipped the world economy into recession. Thermal coal prices at Australia's Newcastle, a benchmark for Asia, and used in electricity production fell by two-thirds since reaching a record on July 4 th, tumbling to $75 /ton on December 7 th . Since then, NewCastle coal has rebounded to $88 /ton, in-line with a rebound in crude oil to $49 /barrel. Xstrata, (XTA.L) the world's biggest thermal coal exporter, had moved to lock in prices to restrict further risk. Xstrata locked in $80 /ton for Australian coal with some Japanese utilities for the 2009 calendar year, nearly 50% less than contracts it signed at $155 /ton last year. Faced with a worsening demand outlook and threats of a supply glut, coal miners could start making production cuts. Xstrata said on Dec 15 th , it has shut down half of its coking coal production at a mine in Australia . Macarthur Coal (MCC.ax) and Western Canadian Coal (WTN.L) (WTN.TO) are also cutting output, due to rising inventory levels as customers delayed shipments amid falling demand. However, recent signs of stability in the commodities markets revived the speculative appetite for investing in the higher–yielding Aussie-dollar, especially after Dec 25 th , when the Bank of Australia signaled a pause in its rate cutting campaign. Benchmark interest rates are 4.25% in Australia and 5% in New Zealand , compared with 0.1% in Japan and zero in the US , attracting “carry traders” back to the higher-yielding currencies, which are correlated with the direction of commodities. The Bank of Australia (RBA) slashed its overnight cash-rate by 300-basis points since September to 4.25%, unwinding a series of baby-step rate hikes that had supported the Aussie dollar's historic rally, since hitting a low below 50 US-cents in 2002. The Aussie tumbled to a record low near 55-yen in October, as extreme risk aversion led to aggressive unwinding of carry trades by Tokyo speculators. 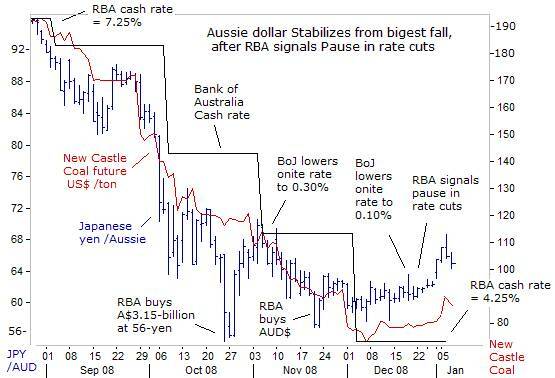 The RBA stepped into the dysfunctional currency markets to buy 3.15-billion Aussie dollars, at 56-yen in late October. The Aussie got an added boost after Japanese Finance chief Shoichi Nakagawa said he was “watching volatility in the foreign exchange market closely,” - code words for intervention. “The fact is that every day I am looking at the market developments with a sense of alarm and urgency,” warned Nakagawa, helping to lift the Aussie to 68-yen this week. Still, a sustained rally in commodities is necessary to underpin a stronger Aussie dollar. Can OPEC Stop the Slide in Crude Oil? Oil prices gyrated wildly in 2008, hitting an all-time high above $147 a barrel on July 3 rd , before skidding to a four-year low of $35 /barrel six months later, sounding off alarms bells from Moscow to Tehran . After the collapse of Lehman Brothers, crude oil tumbled below $100 /barrel, and OPEC pledged to cut its collective output by 2-million per day (bpd), - a pledge that wasn't fully implemented until two months later, after the price of West Texas Sweet had already crashed to $40 /barrel. On Nov 9 th , Iran 's Oil Minister Mohammad Ali Khatibi said the economic downturn had shaved 3-million bpd from global crude demand. “In the short-term the crisis is affecting demand. But in the medium term this will affect supply,” he warned. “ Current prices are too low to encourage investment in the Canadian oil sands and in expensive oil projects in the deep sea, such as in Brazil ,” he added. On Dec 17 th , OPEC agreed to a larger-than-expected 2.2-million barrel cut in its daily oil production, to a new quota target of 24.8-million bpd, or roughly 5% of total world oil supplies. Iran vowed to cut oil output by 545,000 bpd as of January 1 st , in its bid to try to shore up tumbling crude prices. Top exporter Saudi Arabia lowered supply to 8.2-million bpd in December, about 9.7-million bpd in August. Kuwait notified Asian refiners that it will cut supplies by 230,000-bpd from Jan 22 nd . Traders are deeply suspicious of the OPEC cartel, which is often guilty of cheating on its quotas. So far, the OPEC-11 members have cut output by 3-million bpd, still short of the full-quota reduction of 4.2-million bpd that is the minimum necessary to bring global supply closer into-line with collapsing industrial demand. Saudi Arabia signaled deeper supply cutbacks in February, possibly below its agreed OPEC target. “We'll be at our quota, you know we adhere very well,” said Saudi Oil chief Ali al-Naimi on Dec 31 st . Traders will only know OPEC is living-up to its words, when the price of crude oil finally finds a floor, and won't be swayed by Iran 's tricks in the Middle East . The Footsie suffered its worst-ever loss in 2008, tumbling 31% and wiping-out £484-billion off the market value of the UK's top-100 companies. The loss was trimmed from its worst levels, when the FTSE rebounded by 5% in the final days of the year. The Royal Bank of Scotland and HBOS lost 90%, and fears about the depth of the global downturn hammered the heavily weighted mining and oil shares. UK home prices plunged by an average 19% last year, the largest slide in a calendar year, reducing the average home value to £159,896, according to Halifax, or £37,000 less than a year ago. The number of mortgages approved in November for those buying a new home slumped to a record low of just 27,000, only a third of the number arranged in the same month in 2007. The BoE reacted to the crash in the UK-housing and stock markets, by slashing its base rate 350-basis points since October, to a record low of 1.50%. “Zero interest rates are a possibility and further capital injections may be required in the banking sector,” said BoE deputy Charles Bean on Dec 18 th . “Of course, the bank rate is still at 2%, so we still have some margin to go yet, but of course we may find ourselves getting them all the way to near zero,” he warned. Bean said more action by the government authorities is needed to get banks to increase lending, because of the damage done to businesses through a lack of credit. “The central question is to what extent banks around the world cut back on lending to households and particularly businesses. Clearly, the more they do that, the deeper the downturn may be. It's important for banks to behave responsibly. It may well turn out that further capital injections are required, but it's also necessary for banks to feel comfortable about continuing to lend,” Bean added. So far, the BoE's rate cuts since September have only served to crush the value of the British pound in relation to the US-dollar, Euro, yen, and the price of gold. 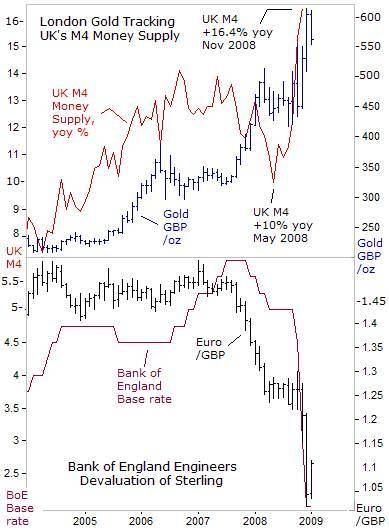 The BoE's rate cuts have also energized the growth of Britain's M4 money supply, expanding at a 16.4% annual clip in November, from +10% in May, which in turn, helped to lift the price of gold 42% higher to a record 600-pounds /ounce, while sterling lost as much as 25% of its value against the Euro. “Quantitative Easing” is the last resort of desperate governments to prevent deflation and depression from taking hold in the economy, when all other policies have failed. While the UK economy remains mired in recession, gold and gilts have been the only asset classes to show a profit during the financial crisis. UK Treasury chief Alistair Darling moved to quash speculation that London was planning to adopt “quantitative easing.” “Nobody is talking about printing money,” he decalred on Dec 8 th . 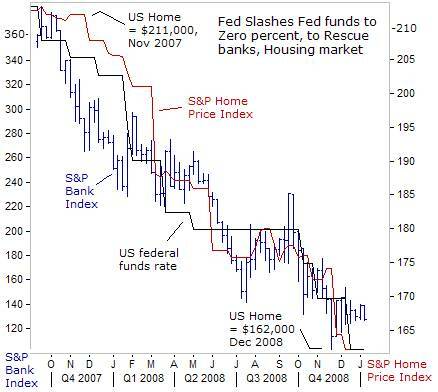 “There's a debate about what to do as interest rates approach zero, as they are in the United States . But for us that is an entirely hypothetical debate,” Darling said. Now that the British government is the majority shareholder in some of the country's leading banks, let's hope to see more lending from the banking sector, to stimulate growth in the economy. When that happens, investors would be better off owning gold, rather than long-term gilts. 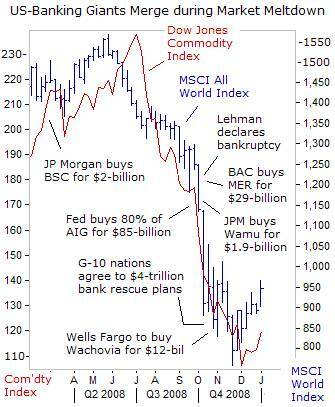 This article is just the Tip of the Iceberg of what's available in the Global Money Trends newsletter. Subscribe to the Global Money Trends newsletter, for insightful analysis and predictions of (1) top stock markets around the world, (2) Commodities such as crude oil, copper, gold, silver, and grains, (3) Foreign currencies (4) Libor interest rates and global bond markets (5) Central banker "Jawboning" and Intervention techniques that move markets. GMT filters important news and information into (1) bullet-point, easy to understand analysis, (2) featuring "Inter-Market Technical Analysis" that visually displays the dynamic inter-relationships between foreign currencies, commodities, interest rates and the stock markets from a dozen key countries around the world. Also included are (3) charts of key economic statistics of foreign countries that move markets. Subscribers can also listen to bi-weekly Audio Broadcasts, with the latest news on global markets, and view our updated model portfolio 2008. To order a subscription to Global Money Trends, click on the hyperlink below, http://www.sirchartsalot.com/newsletters.php or call toll free to order, Sunday thru Thursday, 8 am to 9 pm EST, and on Friday 8 am to 5 pm, at 866-553-1007. Outside the call 561-367-1007. Mr Dorsch worked on the trading floor of the Chicago Mercantile Exchange for nine years as the chief Financial Futures Analyst for three clearing firms, Oppenheimer Rouse Futures Inc, GH Miller and Company, and a commodity fund at the LNS Financial Group. As a transactional broker for Charles Schwab's Global Investment Services department, Mr Dorsch handled thousands of customer trades in 45 stock exchanges around the world, including Australia, Canada, Japan, Hong Kong, the Euro zone, London, Toronto, South Africa, Mexico, and New Zealand, and Canadian oil trusts, ADR's and Exchange Traded Funds. He wrote a weekly newsletter from 2000 thru September 2005 called, "Foreign Currency Trends" for Charles Schwab's Global Investment department, featuring inter-market technical analysis, to understand the dynamic inter-relationships between the foreign exchange, global bond and stock markets, and key industrial commodities. Copyright © 2005-2009 SirChartsAlot, Inc. All rights reserved. Disclaimer: SirChartsAlot.com's analysis and insights are based upon data gathered by it from various sources believed to be reliable, complete and accurate. However, no guarantee is made by SirChartsAlot.com as to the reliability, completeness and accuracy of the data so analyzed. SirChartsAlot.com is in the business of gathering information, analyzing it and disseminating the analysis for informational and educational purposes only. SirChartsAlot.com attempts to analyze trends, not make recommendations. All statements and expressions are the opinion of SirChartsAlot.com and are not meant to be investment advice or solicitation or recommendation to establish market positions. Our opinions are subject to change without notice. SirChartsAlot.com strongly advises readers to conduct thorough research relevant to decisions and verify facts from various independent sources.